You can use any type of kale for this dish, just slice it thinly before adding to the pot. 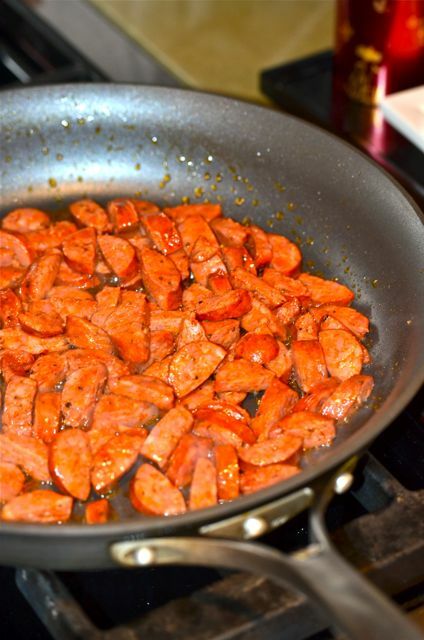 Linguica is a Portuguese, mildly spicy, smoked and cured pork sausage with paprika and garlic. 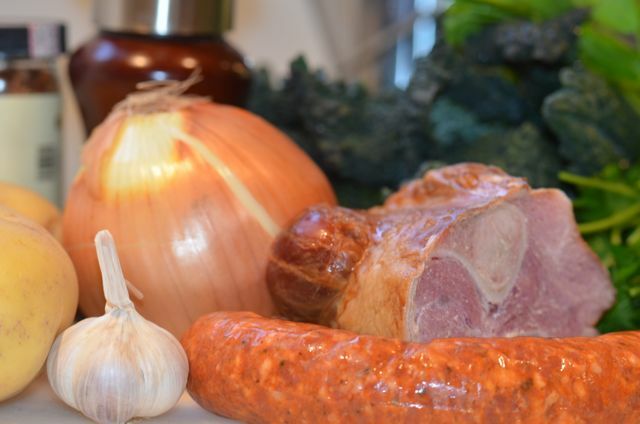 Substitute Spanish chorizo or other cured, spicy pork sausage. 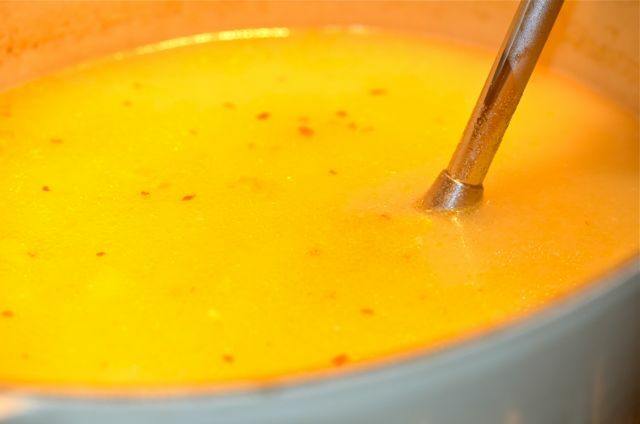 What You Get: A very flavorful and satisfying winter soup. Plenty of veggies, too. What You Need: An immersion blender or potato masher will help mash the potatoes, but you can use the back of a wooden spoon, if you like. No other special equipment required. How Long? About an hour if using salted water or chicken stock. About 2 hours if making a stock with ham hocks. Add the water, ham hocks and a few teaspoons of salt to a large pot and bring to a boil over high heat. When at a boil, lower the heat and simmer the ham hocks until cooked and they pull off the bone, about 1 hour. Taste the stock and add salt if needed, the stock should be just a bit salty. Pull the ham hocks from the stock and allow to cool on a plate. When cool, pull the skin and bones from the ham hocks, pull off any meat and roughly chop. Set aside. 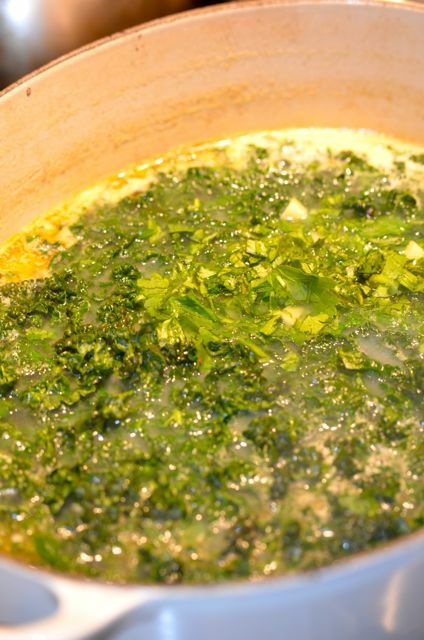 In a large pot, bring the ham hock stock, salted water or chicken stock to a low boil. Meanwhile, put half of the olive oil in a large skillet over medium heat. 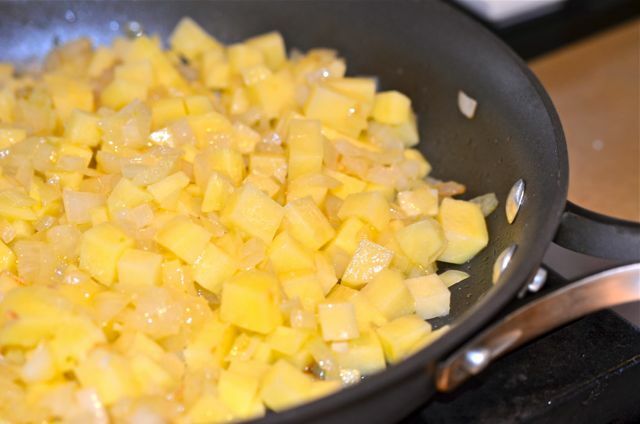 When the oil is hot add the onion and garlic to the skillet and cook until just colored, 2-3 minutes. Add half the potatoes and cook, stirring often, for another 3-4 minutes. Add the potato mixture to the large pot with the stock and cook until the potatoes are mushy, 15-20 minutes. 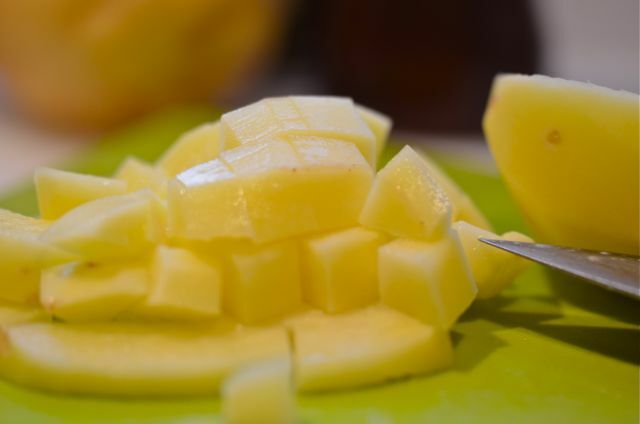 Then, using an immersion blender or potato masher, mash the potatoes until smooth. Now, add the remaining potatoes and cook until done, about 20 minutes. Meanwhile, heat the remaining olive oil in a large skillet over medium heat. Add the linguica and cook, stirring often, until browned, about 10 minutes. Then add the linguica to the soup pot. Add the ham pieces, if using, and stir into the soup. At this point, taste the stock, if you like extra spice, add a pinch of red pepper flakes. When the potatoes are cooked but still firm add the kale, parsley and cilantro to the pot. Cook until the kale is just tender, about 5 minutes. Taste and adjust seasoning. Serve. So that’s what it’s called! I always just called it Sausage and Kale. And you’re right…it tastes so much better when it is cooled and heated at least once. I make it the day before I want it for that very reason! It travels well in a Mason jar, and stays pretty warm until lunchtime, too. Yum! Thanks! Caldo in a mason jar would be a cool thing to pull out for lunch (everyone else would be jealous). 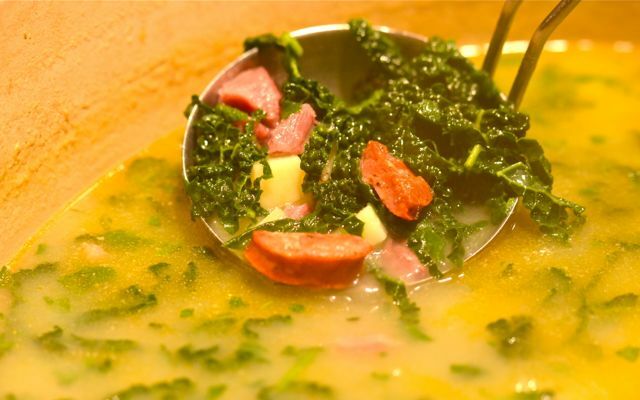 Lovely to see another promotion of the delicious caldo verde, although the recipe I recently posted is somewhat more spartan as per the Algarvian versions I tasted! Thanks. I missed you post the first time, but enjoyed reading it. Portugal sounds lovely. Lacinato Kale posts are great Putney Farm. 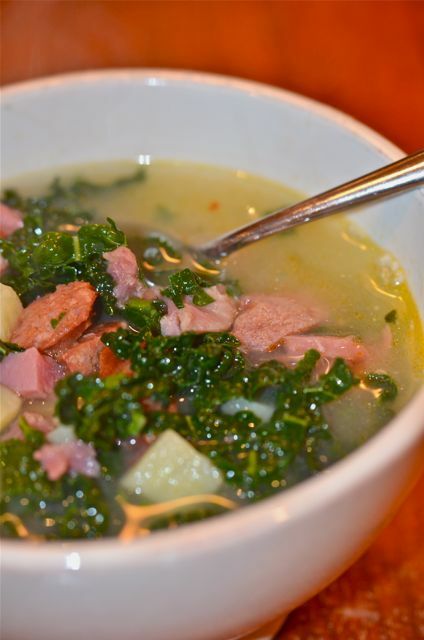 We made Ribollita over the weekend which is another great way to make a hearty kale soup, but we’ll have to try this Caldo Verde recipe a try next time. Thanks, and ribolitta is on the list of things to make…too many good recipes out there (not complaining). 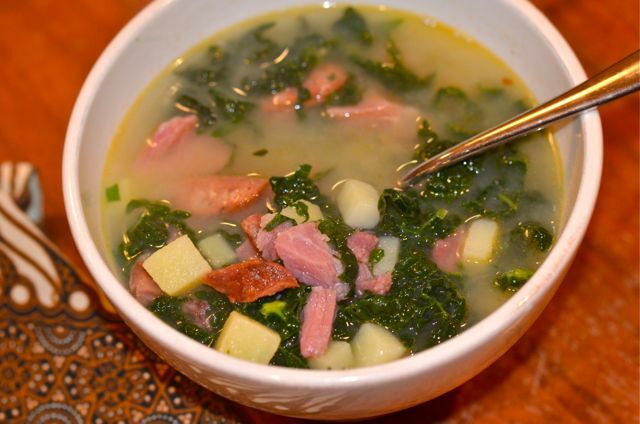 I’ve never heard of Caldo Verde before and when I first started reading this post I thought, Nooooo way. But when I went through your list of ingredients, I’ve completely changed my mind! This sounds dee-lish! Worth a try and easy to tune to your tastes. We also have a cocktail coming that you will enjoy…based on an old movie classic…coming soon. This looks great. I’ve got some greens (still) put up in the freezer which may want to come out and play with some sausage I discovered hanging with the feta in the cheese drawer when I cleaned the fridge today. Though I also cleaned out part of one freezer and made chicken stock (it’s like jelly, it’s so thick) so I’ll use that instead. Like the sounds of that chicken stock (any soup you make with that will be good!). Hope you enjoythe soup! It can be done- the salty/briny notes could be used a coupe of ways…hmmm. I had to share, yes, my own Muddy take on the C.V. I grow the traditional Beira Kale each year just to make the dang soup from it! http://themuddykitchen.com/broke-hungover-with-guests-2/ It’s a beautiful garden veggie and I just ordered up a packet of seeds for this year’s crop. For me it’s all about the nubile, fresh-burst kale and deft chopping. I go vegetarian, not because I don’t adore the s*usage, but because the flavors are so bright and restorative without any distractions. I serve the meaty junk on the side. Thanks. And hope you feel better. We make veggie versions as well, but the boys are always more easily sold on pork (except with veggie curries- making progress there). I do like your recipe cooking the fine kale in the bowl…nice presentation…hmmm..
Yeah — unfortunately that cocktail may take a while. My liver had a little run-in with my latest course of Lyme antibiotics, rendering it slightly unable to function. In Thailand. In the jungle. Hours down the Mekong by longboat to…another longboat. Weren’t pretty. Me and liver (Liver and I? ), we’re on the mend though and are looking forward to an ice cold beer round about June. I will then share the Four Seasons Golden Triangle recipe for Tom Yum Martinis with you. For now I can’t even say —(rhymes with lotka)– aloud without feeling icky. Ugh. Sort of your own little “Heart of Darkness / Apocalypse Now” moment…. Cool- any difference in the recipes? It goes along that way, green leaves, linguiça and potatoes. But in Brazil we use Mandioca(cassava) instead of potatoes. How exotic. All I do with kale is wash it, tear it into a steamer with sliced sweet potato and cauliflower and voila, food for a single gal. Interesting recipe! I would never have thought to combine kale and cilantro. We’ve had so much frost here that the kale now should be nice and sweet, so I could try to make something with kale and perhaps something like this is a good idea. Great post with great photos as usual! I’m not really a proponent as soup for a meal, but this looks hearty enough that I’d make an exception. The colors, ingredients, and use of pork really just look incredible. Do you think this would be good with a little green chili spice for a little kick? Green chili would work pretty well to replace red pepper flake. You may just want to taste along with the linguica (spiciness varies).